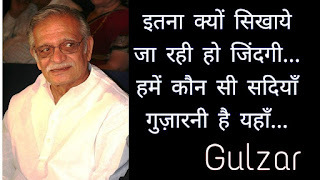 Gulzar Status in Hindi 2019 We have listed and collected Gulzar Status in Hindi in one serial. Finally, after so much research we manage to publish this collection of Quotes. I have one little complaint with the younger generation. They always look at the present as very shrunken and defective. It’s no good. The older generation may live in its past, in nostalgia. The streets were small, then. The homes were small. Life itself was small. Society was small. Nothing was open like it is today. Today is much bigger. I believe words should amaze or amuse. Only then will the listener want to understand the meaning of the song. When people meet me and call me by my real name, I don’t appreciate it. I feel as if they are boasting that they know my real name (Sampooran Singh Kalra). They say he’s watching us from the heavens. If he doesn’t answer, I tell him in this poem that I’m going to pull this curtain of the sky and forget about him. It is a way of expressing my anguish, written when I felt helpless. Everyday life is much more interesting to me than big, abstract theories. 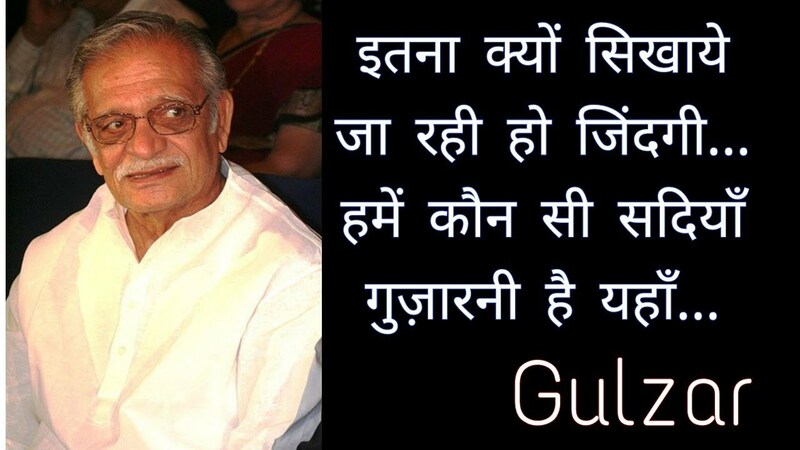 Through my poetry, I aim to reflect our times. I don’t want to dwell on the olden days, although it is a period I mention often. The tune. That’s what stays in your mind. When the tune starts galloping, you need reins to hold on to it. The words become useful there. They are the reins that allow you to ride the horse. Human relations do not always rely on meeting each other in person every day. When we talk about relationships between people on either side of the border, just a few thousand miles can’t keep love from growing and blooming into a beautiful bonding. I usually write words on the meter of the tune. It could be the other way round, and the composer will write the tune based on my words and meter. I feel that India’s story is like walking up a spiral on a mountain. You walk and walk and then you turn and you can see the sky. Your generation is very selfish. They don’t want India for its Ganga, but for their economic pride and self-respect. I’m hopeful because the chaos and crisis have reached a saturation point. This is our only chance. If it goes down a little bit more, then there is no scope. The youngsters have to realize that things are in their hands now. But when I get feedback from people that my imagery is difficult to understand, I get to know whether or not I communicated my thoughts well. A tree can’t grow by itself, it can only grow when someone prunes it. I want him to come and answer. He’s there, right? And if God is responsible for everything, why doesn’t he come and see it? And why doesn’t he answer how it can be his will to kill 150 children in Peshawar? That’s what they said about it, that it is God's will. The poems on fame are more of a question than an answer. I want to know what people see in me when they put that garland on me. The poetry is always churning in my mind, and I got it down. I don’t need any special conditions in order to produce my work. I can write anywhere because just as life goes on all the time, this process of thinking and writing goes on alongside it. All I wanted was a moment alone, to sit and weep.